I’ve been toying around with the idea of sharing an email a week on Boriquablog, so as to make the blog a bit more interactive. We get a fair amount (thankfully!) of emails a week, and they cover everything from “so glad we met”, to “I have a great tip for peeling green bananas”, to any scad of recipes from all over Latin America. Well, I think that from now on, we will choose an email and post it over the weekend, so that others may share in the BBlog love. To start things off, this week, I am going to begin with an email that I received today from a young woman that I met over the weekend at the Ocean County Book Fair in Tom’s River, New Jersey. We had a beautiful turn out, despite the weather, and everyone really had a terrific time. I have posted the pictures that Migui took on my Flickr account (look at the photo album icon on the right side of the BBlog page), so feel free to look through them and comment on them if you like. Just for the record, since I get to meet and chat with so very many of you (it’s my favorite thing to do! ), if you write to me after an event, please describe yourself or what you were wearing, so that I can identify you a little easier. Let me know what you think of this idea. I look forward to hearing your thoughts on it! I had the pleasure of meeting you this past Sat., Sept 27th at the Toms River library. I was looking forward to seeing you for quite some time. What ever it is that I imagined (I have a habit of over hyping everything up) the experience was 200% better. You are so entertaining. You made me laugh and cry again and again. I usually am running around with my kids (14, 12 and 4) and don’t often have much time to do exclusively me things. But this Saturday I woke up extra early dolled myself up drove my eldest to watch the varsity football game, left my 12 year old at CCD with some one to pick him up after and then took my 4 year old and hubbie with me to see “Daisy Martinez”. I am sure you can understand the daily running around just to get out the door. Soooooo glad I did!!!! I honestly feel we had the same upbringing. I grew up in Astoria, Queens and at the time I think I was the only Hispanic person in elementary school. Who lugged around a small thermos for lunch with asopao de pollo o camaron, or arroz con pollo or something delicious porque “ham & cheese” era porqueria fria! All the other kids got to throw there lunch paper bag away to play recess and here I was still lugging my thermos. But now, I wouldn’t have it any other way. As I had mentioned or tried to at the library I grew up watching Sesame Street, Lidia’s Kitchen and Jacques Pepin since forever. Then of course later came the Foodnetwork for an abundant amount of cooking shows for me to watch because I love to eat, cook and entertain at home (as long as I’m feeling happyJ). 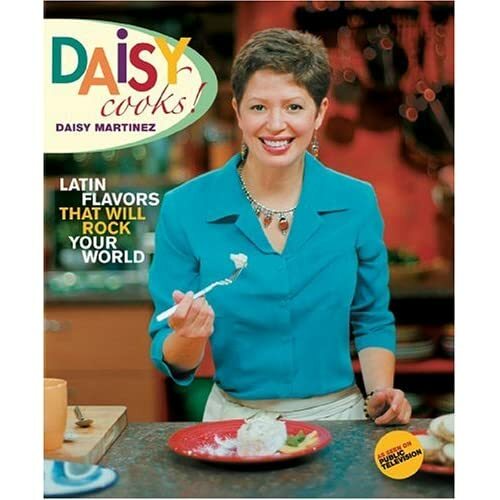 When I had just lost any hope of it ever happening, and I assure you I almost fell off my coach when I scanned the channels and there was this beautiful Puerto Rican woman on “Daisy Cooks” talking about making sofrito?!! !, chicken and yellow rice etc…how far we have come…why did this take soooo long????? I almost cried. OK…I did. 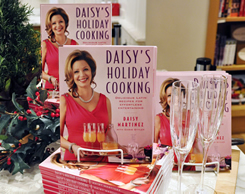 You addressed my Daisy Martinez cook book to my middle son Nicholas as I asked (he was very excited) and we plan to cook together as we have been and as you suggested get it all dirty. After he and I came home he saw how proud his Mami was to get to see you. I will be 40 in a few months and it took a long time but you have surely been worth the wait! And honey for 50 you look fan-ta-bulous!!!!!!!! You make 50 look like well…I want to be 50! Lastly, I was floored by your story about your husband gifting you your admission to the CIA for your 40th birthday. How wonderful. I am really looking forward to my 40th birthday because it has been confirmed that life just gets all the better and everyday is a new chapter. I also believe as you do that God has a plan for all of us. After hearing you speak I believe you were meant for this part. I will remember and hold that Saturday in my “wonderful day memory bank”!! Best of luck always and Thank you…very much! Thank you, Carol…it’s people like you that make my job the best one on earth! Oh! Before we both get in trouble (lol), the gift I received from my hubby was actually for the FCI in NYC. It’s an easy mistake that everyone makes, with all those initials and everything ;-). It was a pleasure to have met you and I look forward to hearing from you again real soon. Keep the faith, and give Nicholas a kiss from me! !